Despite several visits over the last few years, there are large areas of Berlin I cannot claim to know. And those include areas just off the main tourist avenues. A guide book and a good map comes in useful, and in this case Peter Sutcliffe’s Around Berlin in 80 Beers book showed me where to go when I had some time to spare before meeting up with my group at the Zoological Garden. The Zillemarkt is just five minutes walk from the Kurfürstendam, but check on the map first, as the street numbering system might lead you astray. This is a fairly large tavern with outside seating on the pavement and a beer garden at the back, both of which are convenient for an afternoon refreshment. Loads of rustic German food, from the Miljöhplatte – which they claim is a good substitute for a week on full board – to smaller hot and cold snacks. I did not try the food. They have, however, a few special house brews, which was the reason for me stopping by. The Zillebräu Original is an unfiltered Kellerbier. Light, yet full flavored. A liberal use of hops as well as grain. A hint of yeast and a pleasant harsh hoppiness. Sweet cereals in the finish playing with the herbal hops. The Zillebräu Schwarzbier has a coca cola color and a firm beige head. Lots of sweet caramel, as the Schwarzbiere tend to have around here. Bread, liquorice, there is good stuff here, but ut ends up with too much of a sugar overdose. These beers are brewed especially for the restaurant, though the waitress was vague when I asked where. Peter Sutcliffe has not been successful in getting any details, either. But the Zillebräu Original is well worth a detour if you get an overload of window shopping on the flashy streets a few blocks away. In good company, I’m sure this would be a fine place to make an evening of it as well. There is even Weihenstephaner Hefeweisse on tap if that’s what you fancy. Their web site has all the details, including the weekly menu. Seen from the outside, Germany might seem big and monolithic. When you spend some time there, you get more of a feeling of the regional differences, from Schleswig-Holstein on the Danish border to the Bavarian south. Germany as a nation state is not very old, and the federal structure set up after WWII means that the Länder or states have a large degree of autonomy. And even the states themselves have sub regions, many of them old principalities from way back when. Bavaria has quite a few of them, each proud of their identity, many of them the size of a small European country of their own. Franconia covers the three northernmost administrative districts of Bavaria, and, while researching before my recent visit to Berlin, I was pleased to discover that they have a strong presence in the capital. 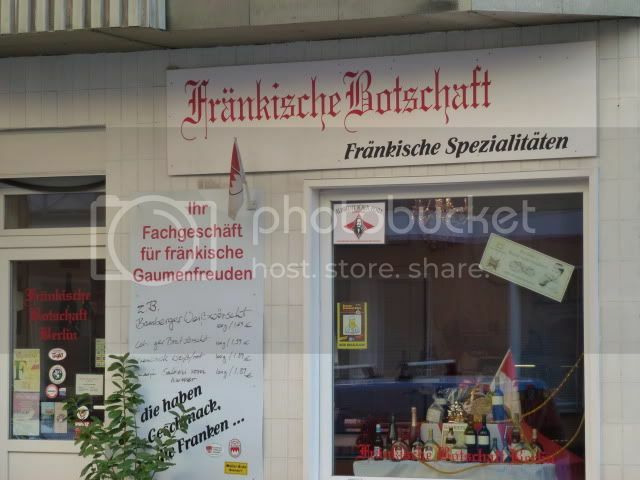 Not content to call it a mere shop, the Fränkische Botschaft, umlaut and all, means the Franconian embassy. Why embassy?, their web site asks. Because we want to be an embassy for Franconian flavour and way of life. The main costumer base is probably natives of the region, but you don’t have to be a native to be greeted by a Grüss Gott! It is not a big store. A counter with meat and sausages. They offer carp and other freshwater fish when in season. Farmhouse bread, seasonal vegetables. Chocolate and sweets. Fruit preserves, juice, wine and schnapps. 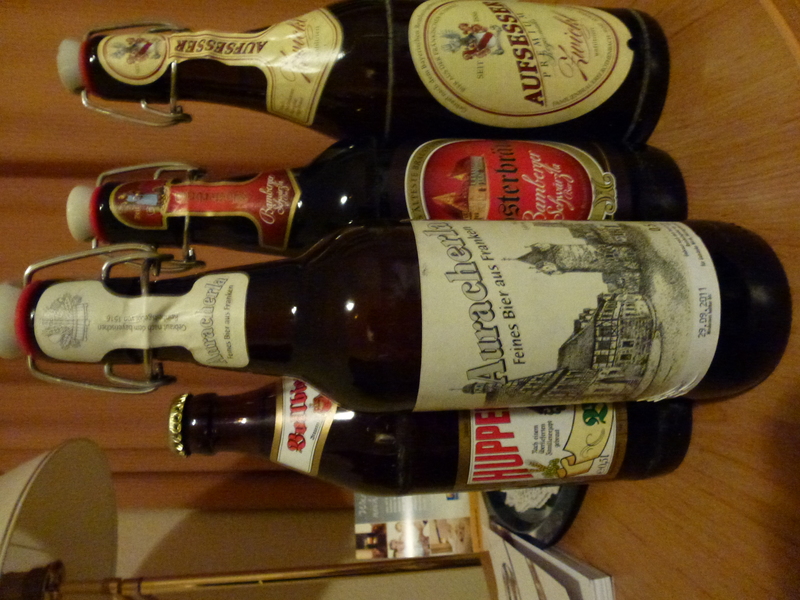 But the main reason to go here is the splendid selection of Franconian beers. Some of the more famous smoked beers from Bamberg are present, but there is also a range from small breweries in villages and towns you probably haven’t heard of. Regular supplies means the beer is fresh. 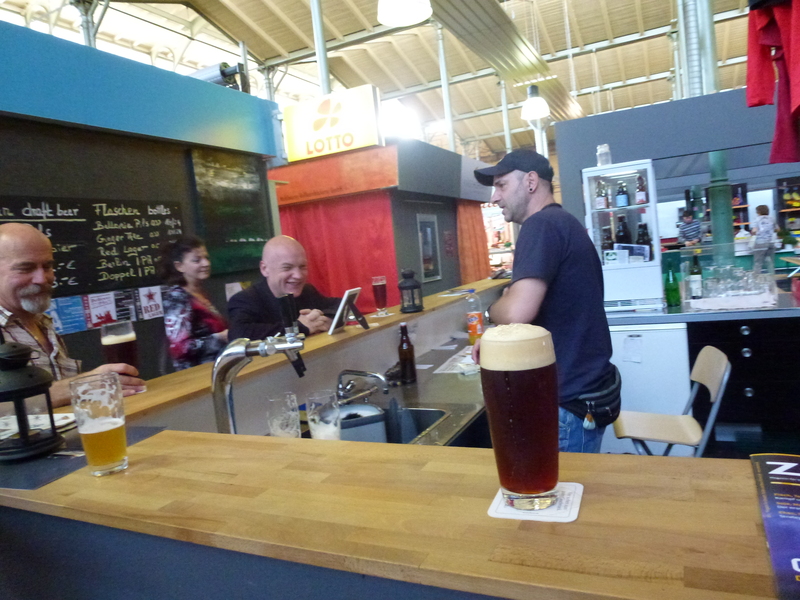 When I was visiting there was a broad range of unfiltered Kellerbier, I believe there will be bocks and other seasonal offerings when they are available from the breweries. I bought as many I could fit into my backpack, and I could not resist adding some cured ham and sausages as well. The price level? Beer is not expensive in Germany. You could probably find something slightly cheaper if you bought it by the crate in a LIDL – but here you get the real stuff. Mostly in swing top bottles – it never went out of style there. Walking distance from Unter den Linden – but a taxi might be needed on your way back! The only thing missing here would be a small Bierstube attached with a few beers on tap and some regional snacks. Berlin is a green city, with large areas of parkland and broad avenues. Most of the houses are low. This means that you have a sprawling city,and getting from one end to another might take some time. Luckily there is an excellent public transport system. 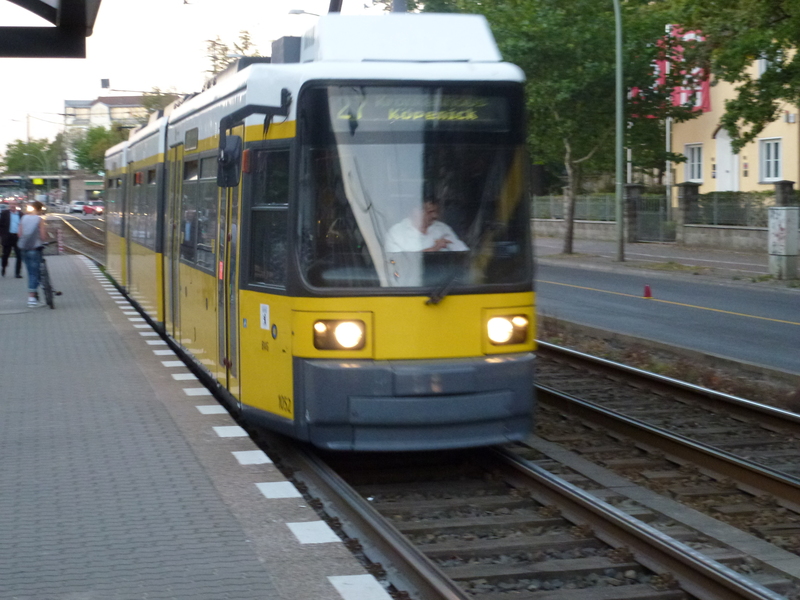 20 minutes from downtown Potzdamer Platz I was ready for tram line 27 to take me the final leg to the Southeastern suburb of Köpenick. I’m sure there is plenty to see in this lakeside town that has been gobbled up by Berlin, but that will have to wait for another time. Right on my tram stop – in the bottom right corner of my printout of the tram system- was the castle square and the Schlossplatzbrauerei. 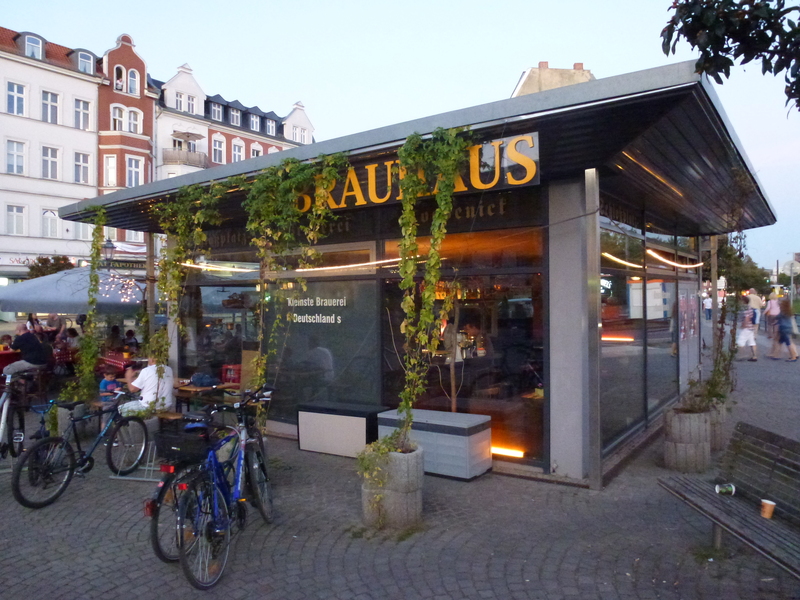 According to the signs, this is Germany’s smallest brewery (though it looked bigger than Brewbaker to me). Dusk was approaching, but it was a mellow evening for the season. 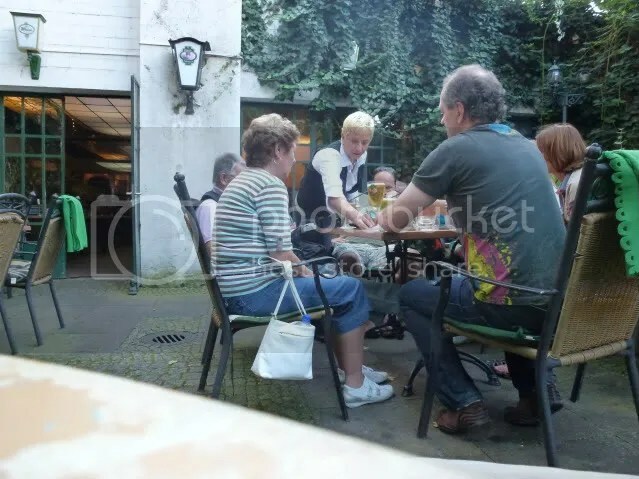 I did not mind that as all, as the small kiosk-like pub was filled with smokers, so the outside tables were more tempting. 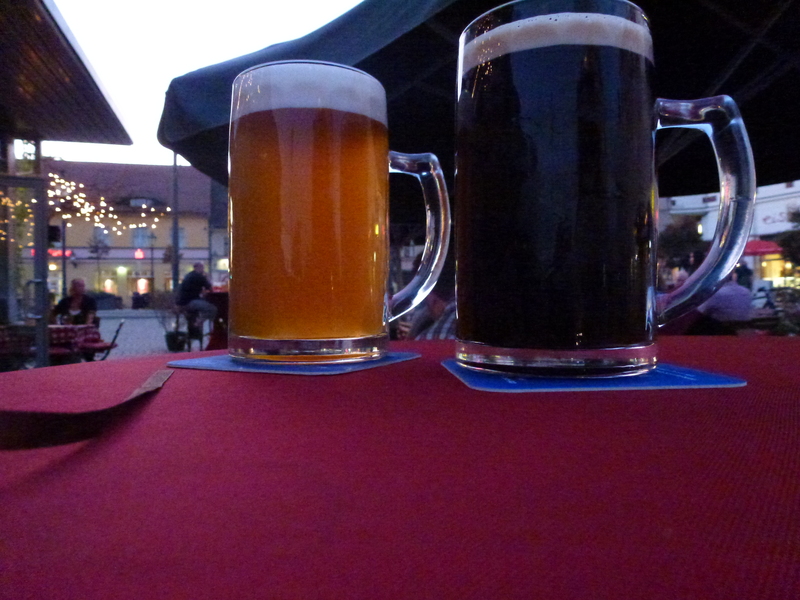 Fast and friendly table service, and I started with their regulars, a Helles and a Dunkel. The Helles had a nice bead crust home brew feel, combined with a crisp citrus sting. Slightly spicy, too – white pepper. The Dunkel had coffee and chocolate bisquits. Dark rye bread, cinnamon and cloves. On the sweet side, as the dark beers tend to be around there, but not in any way sticky. I asked for the Rauchbier, which was hazy dark brown in the glass. A lovely bacon smokiness and a fine malty body. The aroma and the first sip were more smokey than the flavour deeper in the glass. My favourite of the lot. Their Bock was easy drinking and a bit anonymous. Well balanced, a wee hint of smoke and discreet hops. I did not finish the Kirsch-Chili beer. Sweet fruit, like the more commercial Belgian fruit brews – then a nice chili warming creeping in. Top marks for being inventive, but it is mostly a gimmick. Time to find the stop from my tram back into the more central parts of Berlin – careful reading of the timetables had showed me that the hotel was on the same line, about thirty minutes away. In German and the Scandinavian languages, a Köpenickiade is another word for a scam, named after an impostor about a century ago. Don’t worry, there is nothing untrustworthy about this little gem of a brewery as far as I can tell. And I’ve seen many of them. This is well worth a detour, and you should probably make a day of it. 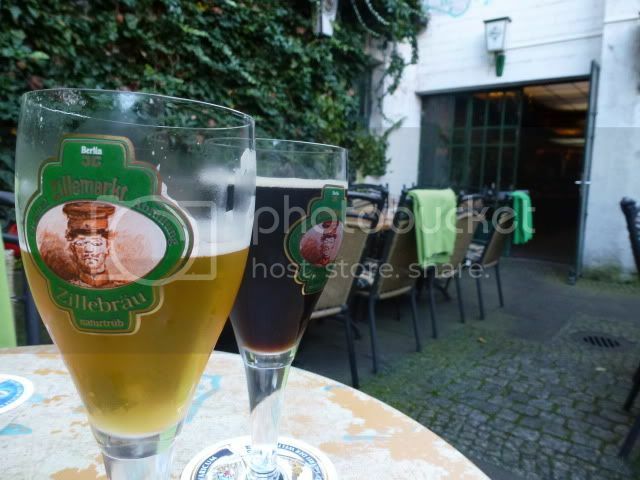 There are a few more bars in the Around Berlin in 80 beers book that you could explore, too, and there are probably more hidden gems to be found. Once again a visit to Berlin, and the city was enjoying a glorious Indian summer. A fairly busy schedule, but careful planning and good infrastructure made it possible to visit a few beer places this time around as well. I have visited the brewpub Brewbaker in its previous incarnation, when it was located in the railway arches of the Bellevue area. It has moved since then, I guess about a kilometer or so. 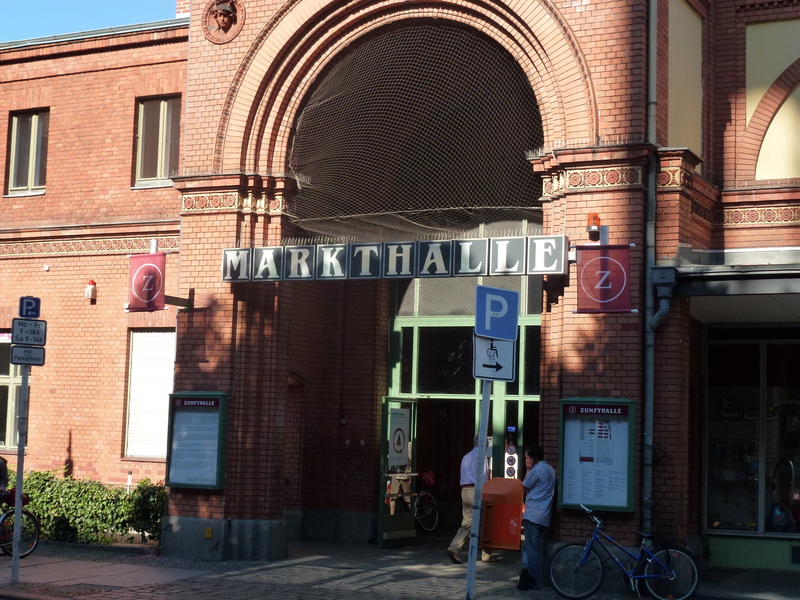 The Moabit market halls are signposted from the U-bahn station, and even on a Saturday afternoon, the market is easy to navigate. There is a butcher shop, a poultry stall, a cheese monger and a wine shop. Their products seemed fine enough, and the prices seemed decent, at least for a Norwegian, The place was, however, almost empty at two on a Saturday afternoon. Not an encouraging sign. This is the time when it should be filled with weekend shoppers, either picking up food to take home or to enjoy at one of the picnic tables in the market hall itself. Anyway, I was not there to do any market research on German shopping habits. On to the brewpub, discreetly hidden behind the cheese shop. I have had their pilsener before, it is even available bottled at the airport, so I wnt for the other beer on tap, the Moabit Festbier. Lovely hazy brown. Cereals, malt, full bodied. An elegant hoppy bitterness to balance, even some sourness related to a proper German Altbier. And the lovely freshness that you get at some brewpubs, trying to seduce you to have just one more. 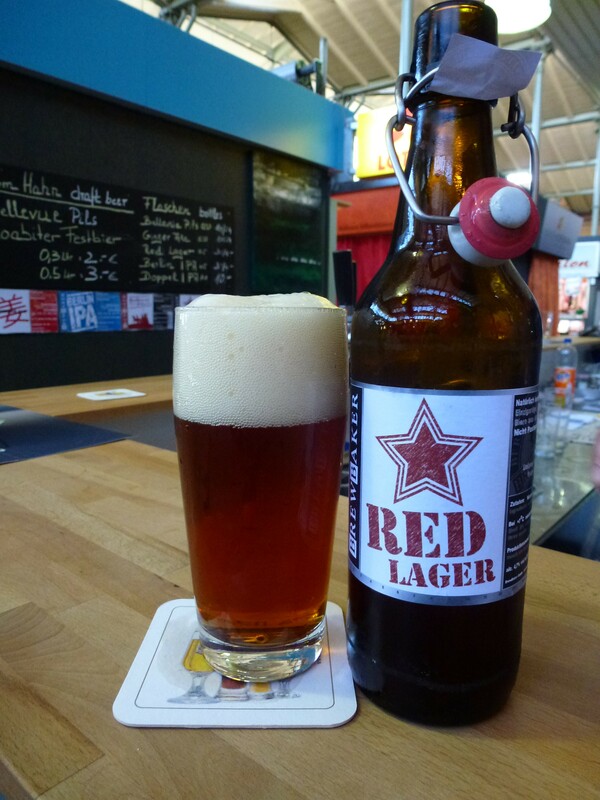 The Red Lager was available in (hand-)bottled form. Hazy red brew, creamy head. malty body, but it is the crsip bitter hops that really makes this beer sing. Long lovely bitter tail. The service was polite, if not very warm, and as they actually close at three on Saturdays, it was time for me to leave for my next stop. I did, however, buy two bottles fo the Doppel IPA, a strange hybrid if there ever was one.